What is the Strategic Plan for Economic Development? It is our region’s collaborative effort to define priorities that will lead to creation of well-paying jobs, and help our key industries and workforce navigate the challenging transition to an Information Age economy. The result is Propel L.A. – led by a dedicated team within LAEDC, focused on implementation and ongoing support of the Strategic Plan. The many participants in the development of the Strategic Plan identified 7 Goals addressing root causes of poverty, stagnant wage growth, and inadequate pathways to an improved quality of life. 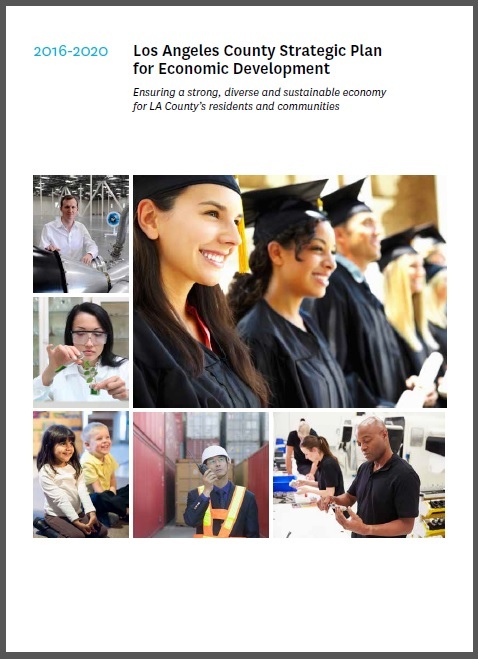 Through the collaboration of over 500 partners in 26 focus groups, Propel L.A. seeks to connect and communicate the many voices of LA County’s 10 million residents, toward one purpose of advancing opportunity and prosperity for all. Learn more about the work of Propel L.A. HERE. This plan serves as our region’s roadmap to increase shared prosperity and increase standards of living for our diverse residents from all regions of L.A. County, in the face of unprecedented changes occurring in our economy. The Strategic Plan doesn’t treat the symptoms of economic distress. Instead, the many participants in the Strategic Plan have selected priorities to address the root causes of poverty, tepid wage growth, insufficient pathways to middle class. The resulting goals and strategies will foster higher standards of living for our region. How is LA County doing? Track key indicators through Propel L.A.
What progress have we made against the 2010-2014 Strategic Plan goals?